Since it was established in 2012 the SA Military Ombud office has dealt with more than 1 500 cases reported to retired lieutenant general Temba Matanzima and his staff. 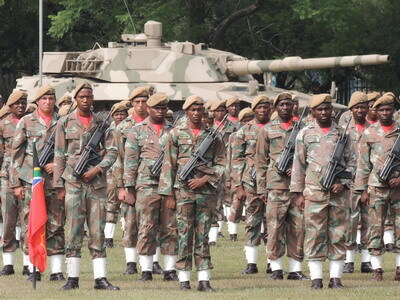 While not stating it as such, a statement issued by the Ombud points to an unhappy SA National Defence Force (SANDF) as far as promotions, post grading, terminations of service, dismissal, pay progression and deployment are concerned. A statement issued by the Ombud head of communication, Nthombikayise Mdluli Jacha, said Matanzima’s office has become a place where unhappy airmen, military medics, sailors and soldiers can find hope with “unresolved grievances after exhausting all mechanisms in the Department of Defence individual grievance system”. “The Ombud office has concluded investigating more than 1 500 cases to date as more and more members continue to launch grievances against their employer (the SANDF) hoping for a fair and impartial outcome,” she said. One example is that of Lieutenant Colonel Mazibuko (not his real name). His call-up was allegedly discontinued by the Department of Defence. He then approached the Ombud to assist him in having the decision taken by his seniors set aside as he felt it was procedurally and substantively unfair and inconsistent with regulations 11 and 28 of the Reserve Force Regulations. The officer’s call-up was reinstated following intervention by the Military Ombud. Jacha quotes the aggrieved officer as saying “he felt good after his case was resolved and he got his job back”. “I can see the Military Ombud is working and is here to assist SANDF members who have problems with the Department of Defence,” he told her, adding the professionalism shown by Ombud officials was impressive. Responding, Matanzima said it was “encouraging to see many soldiers happy with the work of my office”. “Our job is to promote good governance and make sure the Department of Defence applies policies – without fail,” he said, adding the success rate achieved proved the Ombud was not a toothless watchdog. “There are many soldiers who have been unfairly dismissed and our intervention has seen them back in their posts,” he said. The establishment of the Military Ombud office was driven by former Defence and Military Veterans Minister, Lindiwe Sisulu. She also presided over Matanzima’s swearing in in May 2012. The Military Ombud was initially based in offices in Kasteelpark, east of Defence Headquarters but a year later moved to offices in the Centurion Ecopark to be completely apart from any Department of Defence or SANDF facilities or offices.